"It was very good expirience"
In 2011, the Lídia Hotel*** Wellness and Restaurant Harkány’s newly constructed Wellness section provides active relaxation with a jacuzzi pool, a steam cabin, a finnish sauna, an infra-aroma sauna and a mini gym for our guests. Moreover, there is possibility to requisit services such as body massage. In our Hotel there are 35 two beds (many of them available with extra bed if needed) and 2 Family-Room availabe for our guests. Each of these comfortable rooms contains a TV, telephone, bathroom (shower, toilet, hair dryer), tea kitchen, fridge, acces to WI-FI and a balcony or a terrace, if the room is on the ground level. From 01.03.2013. is a lift in the building. With 90 seats, our exclusively furnished Restaurant, at summer with an extra 50 seats in the garden awaits for our guests. We welcome you with homemade tastes, hungarian and international food specialities. You can choose from the menu or order half board in there. Our Restaurant is non-smoking. Smoking is only available at the designated areas. Harkány can be found at the southern part of Baranya County, 25km from Pécs, and only 8 km from the Croatian border. Harkány is not just a town for relaxation, but its helping those who wish to recover. Our Hotel is open all year long, and it has floor heating. Harkány owns the one of the spas in whole Hungary. It's watert was discovered in 1823 and it's been gained from 3 wells with a temperature of 62 °C. It's specific medicinal water containing high amounts of sulphide and trace elements contents is cut out for the treatment of any type of locomotor diseases, gynecological diseases and stomachache - not only the bathing, but in the form of mud-pack and drinkin cure too. The total capacity of the room is 2 adults. With children under the age of with children under the age of 14, max. 3 people guests can be placed in the room. 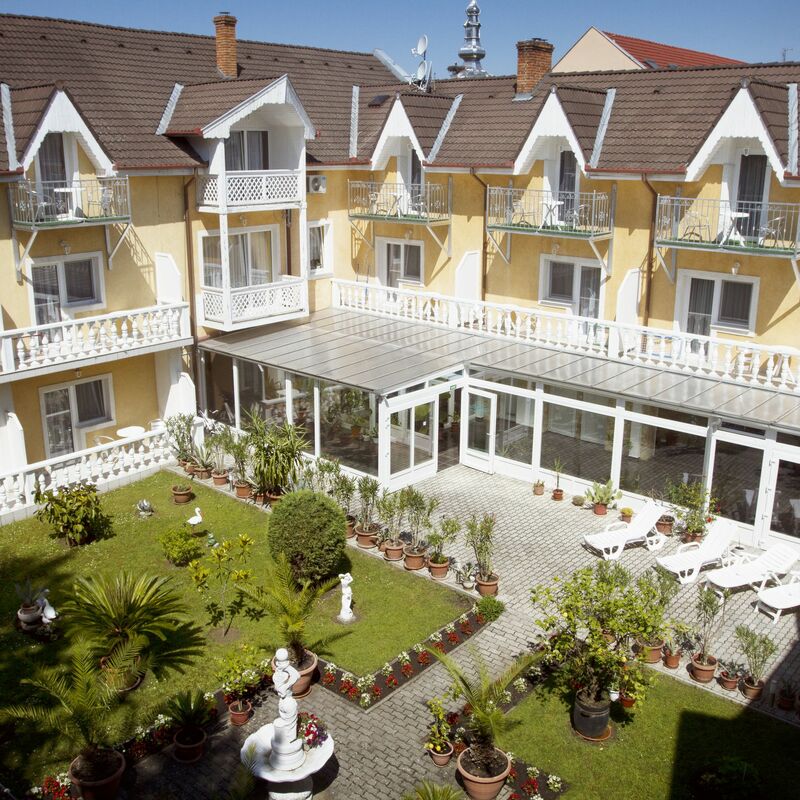 The rating of Lídia Hotel Wellness és Étterem Harkány is 9.1 from the maximum of 10, based on 201 real guest reviews. "In the restaurance we have a problem, because nobady speaks english :-("
"Sajnos nem volt beüzemelve a jakuzzi, azzal az indokkal, hogy kevés vendég esetén nem éri meg. Ezt kicsit sérelmeztük, mert ugyan olyan vendégek voltunk, és kicsit csendesebb időben tudtunk menni." "Nagyon kedves volt a személyzet, tiszta szoba, finom reggeli/vacsora"
"A fitness gépek leharcoltak, a jakuzzi csupa vízkő. A parkolás rendjéről nem tájékoztattak a recepción és büntetést kaptunk emiatt." "A szoba kényelmes volt és tiszta."